Successfully Added Digital Video Camcorder Pen - 4GB + Battery Pack to your Shopping Cart. 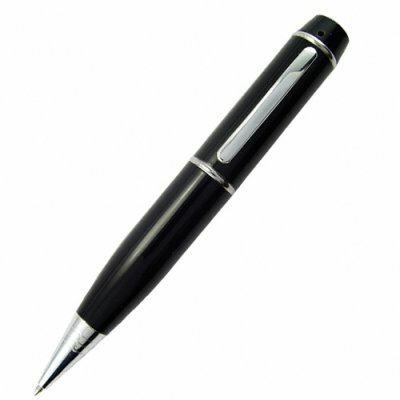 Surveillance style pen containing a micro sized video camcorder with 4 GB of internal memory. Get the mission completed with this awesome secret agent DVR pen, often called a " pen" in the trade. Sitting in your shirt pocket, standing in the pen cup or lying on the desk, no-one will ever notice as you secretly capture their every move. The built in flash memory stores the video until it is ready to be downloaded to a computer via USB. With the pen's native 4GB's of memory and the kits included back-up battery charger you can record hours of surveillance or interviews in between trips back to the office. The color video is encoded on the fly through a buffer system to MPEG4 (AVI) and if the battery runs low during a recording session the pen will ensure it writes the video from the buffer to flash before shutting down. You can also use the device as a flash drive to transport important files around safely. The pen itself is an attractive writing instrument with a gloss black finish on the main body, with easy grip design and chrome detailing. Newest version of our famous surveillance pen line now includes AA powered back-up power charger.